Eat This Now – Greek Spaghetti with Mizithra Cheese at YASSOU! If you’ve never had it, mizithra cheese is a semi-sharp goat and/or sheep’s milk cheese which contains a certain, distinctive sourness that makes it perfect for topping pasta. Pasta like the big, thick bucatini strands the Yassou Greek Grille Cafe (whew!) uses to make their Greek spaghetti. The recipe is simplicity itself, consisting of simply pouring browned butter over al dente pasta and giving it a liberal sprinkling of cheese and cracked pepper. Those flavors of slightly nutty, sour and sharp meld uniquely with the toothsome tubes, making each bite the very essence of simple, soulful satisfaction. Garnish with a little gyro meat and you have a humongous lunch for one, or a perfect pasta repast for two. Best of all, the whole enchilada only costs ten bucks. Where Oh Where Have You Been Hiding ELV? Looks good, John, although owing to the cheese content, I’d avoid ordering it while on a date. Especially a first date. Hey John, with the summer version of Las Vegas Restaurant Week coming up near the end of the month, I am awaiting with baited breath your suggestions of especially good deals. Back in March your suggestions for the spring version were spot on and much appreciated by me. John, as great as that dish looks, it’s time for a new post! ….you’re spot-on arm53. 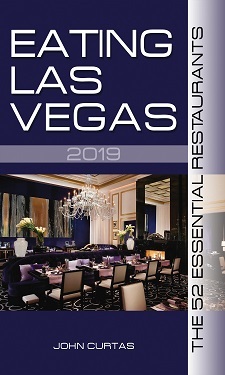 Hey JC, with over 2100 “places to eat” in Vegas you must have missed some of them! Being an avid golfer I would be really interested to hear about the food offerings in some of the course club houses. Salivating for my next trip out. You couldn’t possible be THAT bored with the talent and existing conditions. Possibly a compare and contrast exercise? Hell, even Alan Richman can pull off, albeit mundane, an ever so slightly amusing sandwich USA thing.